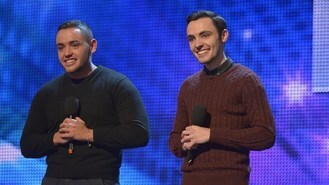 The Britain's Got Talent stars, who finished third in this year's ITV series, held on to the number one spot with their debut The Impossible Dream, selling just 2,000 more copies than their nearest rival. The duo, from Holywell, North Wales, narrowly held off competition from East London collective Rudimental who remain at number two with their debut album, Home. Where You Stand by Travis - the Scottish band's first material in five years - was the highest new entry at number three to give the group their seventh top 10 album to date. Richard and Adam, whose performance in the final of Britain's Got Talent was interrupted by a woman pelting eggs at Simon Cowell, have now overtaken US star Justin Timberlake's The 20/20 Experience to achieve the most consecutive weeks at number one this year. They are now tied with The Motion Picture Cast Recording of Tom Hooper's big screen adaptation of Les Miserables for the most overall weeks at the top. Les Miserables notched up two runs of two weeks at number in January and February. US songwriter John Mayer was straight in at number four in the album chart with Paradise Valley - which features a collaboration with his reported girlfriend Katy Perry - while Stereophonics surged 16 places to five with Graffiti On The Train. Meanwhile, pop siren Ellie Goulding bagged her second week at the top of the singles charts with Burn. The 26-year-old singer songwriter beat Avicii's former chart topper, Wake Me Up, which stayed at number two, while dance track Sonnentanz (Sun Don't Shine) by Klangkarussell was new at three. The original version of Sonnentanz was a smash hit across Europe, with the Austrian duo teaming up with 21-year-old London-based singer Will Heard for the UK release. DJ Fresh and Diplo's single Earthquake featuring Dominique Young Unique was at number four, while Cedric Gervais' remix of Lana Del Rey's Summertime Sadness was down one at number five. Former X Factor winner Matt Cardle and ex-Spice Girl Melanie C were new at 14 with their duet, Loving You.